Corsair® a worldwide leader in high performance computer and flash memory products, announced today that it is expanding its Flash Voyager and Flash Survivor USB family lines with new 32GB capacity offerings. 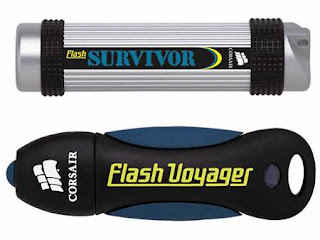 The new Corsair 32GB Flash Voyager and Flash Survivor USB drives will be debuted at the Consumer Electronics Show 2008 (CES) next week in Las Vegas in the Corsair Suite at the Wynn Hotel and at Showstoppers CES 2008. Corsair 32GB drives provide the storage capacity necessary to hold over 16 full-length, high-definition movies or even an entire season of your favorite TV series. These large density drives can also be used as portable back-up devices for critical or sensitive information. In addition, Corsair 32GB USB 2.0 drives are bootable, which means users can actually store full versions of operating systems and applications in order to quickly “re-create” the necessary software environments to troubleshoot system problems. "Whether with innovative designs, like the Flash Voyager and Flash Survivor, or industry leading large-density drives in convenient portable form-factors, Corsair is always pushing the limit of what USB portable storage has to offer," said Jack Peterson, VP of Marketing at Corsair. "Our newest USB additions will allow a whole new set of users – multimedia, technical and data conscious – to take advantage of rugged, high-performance solid-state storage," added Peterson. Macworld Expo takes place from January 15-18th, 2008 in San Francisco, California. Here's Video Presentation of MacBook Air Macworld Expo 2008 a Great Presentation, makes you want to get one! Sporting a silvery finish, the MacBook Air features a 13.3-inch LED-backlit widescreen display that has a 1280 x 800 pixel resolution. The backlighting saves power and provides "instant on" response from the moment you turn it on, according to Jobs. The device has a slightly wedge-shaped profile. It weighs about 3 pounds, and sports a thickness of 0.16-0.76 inches. It's 12.8 inches wide and 8.95 inches deep. The MacBook Air also features a built-in iSight webcam and a full sized MacBook-style black keyboard. The keyboard is backlit, similar to MacBook Pros, and has an ambient light sensor that automatically adjusts brightness. The trackpad is also capable of recognizing multi-touch gestures, similar to using an iPhone or iPod touch. As a result, the MacBook Air's trackpad is disproportionately large, compared to the size of trackpads found on the MacBook or MacBook Pro. The laptop is powered by an Intel Core 2 Duo chip running at 1.6GHz, with 1.8GHz available as an option. Jobs noted that Intel was willing to engineer a new version of the Core 2 Duo specifically to Apple's specifications -- it's 60 percent smaller than others. The chip operates with 4MB of on-chip shared L2 cache running at full processor speed, and uses an 800MHz frontside bus. 2GB of 667MH DDR2 SDRAM is also included. Like the MacBook and the MacBook Pro, the MacBook Air features a slimmed down MagSafe connector for power. It comes with a 45 watt power adapter. A flip-down door on one side reveals USB 2.0, Micro-DVI (to connect an external display) and a headphone jack. The MacBook Air also includes 802.11n-based wireless networking support and Bluetooth 2.1 + EDR. No internal optical drive is included, but Apple will offer a $99 USB 2.0-based add-on SuperDrive for users who need it. For users that opt not to get the optical drive, Apple is offering a new software feature on this machine called Remote Disk; it enables you to "borrow" the optical drive of another Mac or PC on the same network as the MacBook Air, to use for installing software, for example. If it’s portable entertainment, nothing beats the Sony PSP (PlayStation Portable). There’s a new version out called the PSP Slim, widely available with your local grey market vendor. Price varies between $249 and $299. So what’s so good about it? Well, the Slim (PSP 2000) is lighter than the PSP (PSP 1000)—down to 189 gm with batteries. It has been optimised to use less power. The RAM has been doubled to 64 MB. The screen remains unchanged—480x272 (16:9) widescreen TFT LCD.The buttons are more responsive and stick out a little further from the body. The drive seems a little less noisy. The Slim features a video-out connector. When you’re at home or in a Wi-Fi hotspot, you can connect and start surfing. For the price, nothing beats the PSP if you’re into gaming on the move. If you’re a movie buff, however, move on to Entertainment. Thinner and lighter: The new PSP is 19 percent thinner and fully one-third lighter than the original version of the console. Anyone used to the older PSP will immediately notice the reduced weight as soon as they pick it up. Slightly improved cosmetics and controls: The thinner profile offers a slightly sleeker, more rounded look and feel. Even better, however, is that all of the control buttons (the D-pad on the left, the PlayStation circle, X, square, and triangle on the right, and the shoulder buttons on the top) are all sitting a bit more elevated on the chassis' face. As a result, they have a bit more travel and spring to them. They feel just a tad more responsive--and that's a good thing. Faster loading times: The new PSP utilizes a system setting called "UMD Cache" that enables faster loading of game discs. The secret is the new PSP's extra RAM--it's got 64MB versus the 32 on the original model, and just like a PC, more memory enables faster performance. Many games do indeed load faster--while Test Drive Unlimited showed no real improvement in GameSpot's testing, Pro Evolution Soccer 2007 and WWE Smackdown vs. Raw 2007 both showed nice gains, for instance. But don't expect miracles: the UMD load times are still poky when compared to the lightning-fast, Flash-based games of the Nintendo DS and Game Boy. Video output to a TV requires a breakout cable (sold separately), and has a few important caveats. Video output: The new PSP features an AV output jack (which doubles as a standard headphone connector). With the purchase of a special breakout cable (composite and component versions are available for about $20 apiece), you can display the PSP's audio and video on virtually any TV. But there are a few notable caveats--most notably, the maximum video resolution varies according to the content displayed. Video content from UMD discs (prerecorded movies) and Memory Stick (home-ripped videos) can be displayed at DVD-level 720x480 resolutions--though quality will vary depending upon how the compression of the video in question--but games are locked into the PSP's native 480x272 display. So, if your TV doesn't have a robust zoom function, you're stuck with a window-boxed experience for games. Another potentially bigger problem with games is that they don't seem to even work on TVs that can't handle progressive-scan (480p) output. So while nearly any HDTV should be fine (with the component cable), older televisions will be limited to displaying nongaming video output. USB charging: The new PSP can be charged via the USB port, but it's more trouble than it's worth. The resulting trickle charge will take about 5 hours to fully juice up the unit, versus about half that using the standard adapter. Worse, the unit needs to be on and connected to a powered-up PC, and you have to engage the USB mode (as you would when connecting to PC) in order to activate the charge process. If you really need USB charging, opt instead for the Kensington USB Power Tip--the sub-$20 cable lets you charge any PSP (new or old) from any USB-powered jack, including that of an iPod power adapter or the Belkin Dual USB Power Adapter. In other words, there are a couple of nice cosmetic improvements, but the USB charging and video output additions are something of a disappointment. (Perhaps some of the problems can be addressed via future firmware upgrades.) But demanding gadget fans will note that there's still plenty of room for improvement. Even without a radical redesign, the lack of a second analog stick and some built-in flash memory seems like a lost opportunity. Likewise, some persistent annoyances--such as the low volume levels and glossy fingerprint-prone screen--are frustratingly intact. And while it's more a political than a technical limitation, Sony's continued resistance to the homebrew movement seems shortsighted; we'd love to see the PSP be available as an open platform for third-party game and application developers without the need to hack it. Aside from the slimmer dimensions (2.81 inches high by 6.63 inches wide by 0.63 inch deep) and lighter weight (just over 7 ounces--or 200 grams-- with the battery, game disc, and Memory Stick on board), the new Sony PSP doesn't look much different from its predecessor. The luscious 4.3-inch wide-screen LCD display remains, bordered by controls on its left, right, and bottom side, plus two shoulder buttons along the top edge. The button layout is based on the classic PlayStation controller layout--four-way directional pad on the left, square, triangle, cross, and circle keys on the right--so anyone who's used a Sony console over the last decade should be able to pick up and play. The bottom left of the front face also houses an analog thumbstick, for more precise movement. More mundane media controls line the bottom of the screen: select, start, volume, brightness, and a "home" button. 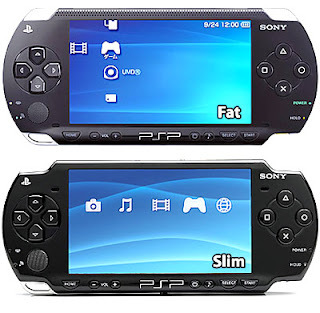 The slimmer profile is immediately noticeable when compared to the old PSP. The rounded contours on the backside of the earlier PSP have been replaced with a totally flat surface. And we mean flat--unlike the rough exterior of the older model, the skin of the new PSP is perfectly smooth. And while it certainly looks even sexier, it may well be too smooth for the sweaty palms of some gamers. 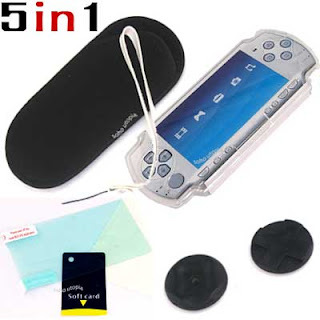 They'll probably want to invest in a case that doubles as a grip enhancer (just be sure to wait for cases that are specifically designed for the new PSP, not its fatter older brother). The Wi-Fi (WLAN) switch takes the place of the UMD eject button. Other changes from the old to the new: the UMD bay is now a bit more low-tech (instead of a sprint-loaded eject, you just pry open the chamber with your fingernail) and the Wi-Fi on/off switch is on the top edge (rather than the left side). And the headphone/AV jack is on the bottom edge, free of the obstruction of the handstrap loop. That doesn't sound like a big improvement, but being able to use any set of 3.5mm headphones--regardless of the size of the plug nub--is a nice contrast to the iPhone's annoying restrictive recessed headphone jack. The Memory Stick Duo slot remains on the left edge. Like the UMD bay, it's a pry-open cover that slides on rubbery plastic rails. If you're not buying a PSP bundle that includes an MS Duo card (or don't have a spare one from a Sony camera), you'll want to invest in a decently sized one. Thankfully, 1GB models are widely available for under $30. 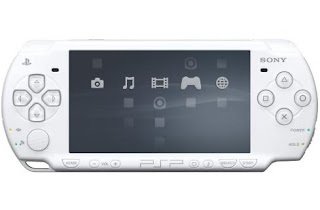 The PSP's interface is known as the Cross Media Bar, or XMB. If you've used the PlayStation 3, or even one of Sony's new high-end AV receivers or TVs, you already know what to expect: it's a pretty slick menuing system that's generally pretty easy to maneuver through using the D-pad and control buttons. As you get into some of the applications, however, that simplicity can get lost. We wished the Web browser, for instance, was as well-designed as the overall XMB menu system. The USB port remains centered on the top edge of the PSP. Sony doesn't include a cable, but it's a standard mini-USB connector, so it's likely that you already have one lying around. The USB connector is flanked by two screw holes that allow for accessories (see below) to be firmly attached to its frame. But most people will use the USB port for quick connections to the PC to transfer digital media--photos, music, video, and even game demos available at Sony's Web site. The PSP is primarily a gaming device, but it's got some notable media functionality as well. Video playback: The PSP can play videos from a variety of sources. The easiest--and most ill-advised--is to buy prerecorded UMD video discs. (With an extremely limited selection, and the fact that the PSP is the only place you can watch them, UMD videos are--not surprisingly--pretty hard to find.) A better--albeit more involved--option is to copy your own videos from a computer onto a Memory Stick Duo card, and pop it in to the PSP. A variety of free and commercial software products can convert files to PSP-friendly formats and resolutions (MPEG4 or H.264-AVC, up to 720x480). Other content sources include TiVo Series2 (the TiVo To Go Desktop software can convert recorded shows for viewing on the PSP) and dedicated flash media recorders, such as the Neuros MPEG-4 Recorder 2 Plus and the SanDisk V-Mate, which can be preset to record TV shows in PSP-compatible formats straight away, with no PC needed. LocationFree TV: Built into the PSP is the ability to stream live TV from a Sony LocationFree TV device, which is Sony's take on the Slingbox. As long as the PSP is in a Wi-Fi hotspot, it can stream the video and change the channels on a LocationFree box, even if it's halfway around the world. audio playback: The PSP doubles as a decent music player, with the ability to play DRM-free MP3, WMA, WAV, AAC, and ATRAC3 files, along with support for album art. Shuffle and repeat modes are supported, along with a visualizer function. photo display: The PSP can display JPEG, GIF, and TIFF photos stored on the MS Duo card--individually, or as a slideshow. PS3 "Remote Play": The PSP can log into a PlayStation 3 on a home network or via the Web, and stream any video, audio, or photos stored on the PS3. The PSP can also download and play some PlayStation Network game titles from the PS3 (mostly PlayStation 1 titles that have been rereleased specifically for that purpose). Web browsing: The PSP has a built-in Web browser, but it's the one place--more than games--where you'll really lament the device's lack of a touchscreen (or even a numeric keypad). A lot of graphically rich pages will be cramped or broken on the screen, and the limited Flash support isn't particularly robust (no Flash-based video, for instance). That said, using the analog stick to control the cursor is nice, and any Wi-Fi connection is fair game (it can handle WEP and WPA encryption). And for a lot of people, it will be a better mobile Internet experience than they're getting on a phone. A separate RSS reader option is available, but it's a little more complicated than we'd like to add your own feeds. Network update: The PSP has an upgradeable firmware, and Sony has been diligent about adding additional features, fixes, and updates every few months. The upgrade is as simple as choosing the option from the system menu. Outside of North America, the PSP media options are even more robust: Japanese users have the option of a snap-on digital TV tuner for over-the-air broadcasts, while Europeans will soon have a video-on-demand service and VoIP communications. Likewise, Sony's international subsidiaries tout other PSP add-ons--a GPS device and a camera--that never quite seem to turn up stateside. 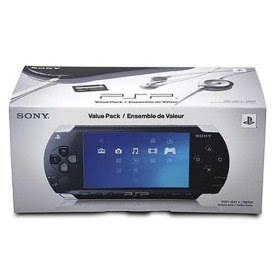 Can the PSP take the place of your iPod, iPhone, or portable DVD player? For die-hard media junkies--those with an 80GB iPod filled to the brim with music and videos--the answer is basically no. But if you're looking to travel with a few hours of music or some TV episodes, it makes for some nice diversion from a game, without having to lug a second device along. And while the screen isn't as large as you'd get with a portable DVD player, the PSP is decidedly less bulky--and its screen is considerably larger than that of the iPod or the iPhone. While its robust media and online functionality are impressive, for most buyers, they'll be decidedly secondary to the PSP's raison d'etre: gaming on the go. Yes, Nintendo's DS remains king of the portable gaming scene in terms of units sold, but plenty of people are looking for more sophisticated (read: less kiddie-oriented) games than the DS offers. And for those who can't abide the oh-so-cute antics of a Pokemon, Cooking Mama, Zelda, Mario, or Animal Crossing title, the PSP will be a welcome breath of fresh air. The graphics on the PSP are noticeably better than those on the DS as well--games are essentially at the level you'd expect on the PlayStation 2. PSP games are more graphically rich--and often less kid-oriented--than many titles on the Nintendo DS. Early on, the PSP was knocked for being little more than the "PS2 portable," because so many of its titles were simply ports of PlayStation 2 games. And, indeed, its hit list is dominated by many PlayStation franchise standbys, including Grand Theft Auto, SOCOM, Tekken, and Burnout. But many of these are phenomenal titles that have been designed for the PSP from the ground up. Genre strong suits include sports, racing, action, and shooter titles, but it's not all sweat and blood, either--plenty of quirky puzzle games (Lumines, Puzzle Quest, Loco Roco) are available, as well as a host of family-friendly favorites as well (Daxter, Ratchet and Clank). It's also worth noting that many of the PSP games include an online multiplayer component. Some games offer ad hoc multiplayer (peer to peer, for playing against other PSP'ers in the same room), others offer Internet play, or both. Online gameplay is free, and--while the experience varies from title to title and is dependent on network speed--it can be just as fun and fulfilling as playing on a home console. To keep its slim figure, the new PSP has a flatter 1200mAh battery than the more bulbous 1800mAh one on the previous model. But, because it uses power more efficiently, it's actually rated for the same play time--3 to 6 hours of gameplay, or 3 to 5 of video playback. Going on a long flight? The more capacious battery actually fits into the battery bay, and offers several more hours of battery life--but the battery cover won't fit over the top of it. (Sony will be selling an extended battery kit, with the larger battery and proper cover.) The better battery life is welcome, of course, but DS gamers will be disappointed--unlike that Energizer Bunny of gaming systems, you'll need to be juicing up the PSP more frequently. Is the new PSP for me? Someday, no doubt, Sony will debut a full-on PSP2, with a host of next-gen features and a more radical redesign. But for now, we've got an evolutionary upgrade of a portable gaming and media console that already had a lot going for it. Existing PSP owners won't need to run out and get this new version unless they really need one of the key upgrades--video out, lighter weight, or faster load times. Anyone else need only look at the available lineup of PSP games. If playing sophisticated, graphically rich versions of games such as Syphon Filter, Metal Gear Solid, MLB: The Show, and--in 2008--God of War is appealing to you, the PSP will ensure that you'll always be entertained. With its impressive game library, lower price, and expanded feature set, it's certainly a much better deal than the original PSP was when it debuted in 2005. And while its media and online functions won't necessarily replace a dedicated AV device or laptop, you may well find it to be good enough in plenty of situations.